Faced with an opportunity to capture key road win and continue to build a respectable NCAA tournament on the road against the West Virginia Mountaineers, the Texas Longhorns did exactly that, and so in convincing fashion, cruising to a 75- 53 win behind a run and career showing from Courtney Ramey. In what rapidly – though unsurprisingly – spiraled into a foul-plagued first half, Jaxson Hayes became the whistle-happy refs first victim. Hayes was whistled for his second foul just 2:34 into the action – at this juncture, Hayes' foul total matched the point total, as the Longhorn captured the first points and a 2-0 lead. 6:00 mark that West Virginia finally appeared on the scoreboard. Just seconds later, Kerwin Roach II connected to the first of two three-pointers within a 45-second team, stretching the Longhorns' lead to 10-2. That was at least, until West Virginia found its way to a bit, piecing together a 6-0 run and ultimately trimming Texas edge to 12-8 entering the under-12 media timeout. The Mountaineers continued to chip out of the break, as Jase Febres married Wesley Harris with a trip to the free throw line for three attempts. Not to be outdone, though, Elijah Mitrou-Long answered and joined the action with a couple of his own just a couple of possessions later, and then after another couple of possessions, Courtney Ramey connected from deep to push Texas' cushion to 18-12 ; the first three of his 19 points, which are a career-high. After Texas took a 20-15 lead into the under-eight media timeout, Jericho Sims numbered and-one opportunity, though he did miss the free throw. Moments later, Ramey found Sims for an ally open, extending Texas "lead to 24-15 and forcing a WVU timeout. A Derek Culver free throw and Ahmad drive and finish at the rim made for a quick 3-0 mountaineers, but Ramey then responded by burying yet another three. Suddenly nearing a double-digit deficit, West Virginia has some momentum when Jermaine Haley three kicked a 10-2 Mountaineers run, cutting the Longhorns lead to 29-28 and forcing a timeout. Texas took control of the final minutes, though, as Ramey took his third three of the half to lead the Longhorns to a 5-1 run and a 34-29 half edge. The second half kicked off in a similar fashion to the first – with a Texas run. Roach kicked the scoring with a quick dunk after a great backdoor cut, and then Ramey's fourth three of the evening pushed the Longhorns lead to 39-29; their largest of the game. That lead only continued to swell, though. After watching the majority of the first half from the sidelines, Hayes cashed in on all-open from Matt Coleman III, and then cashed in on an and-one opportunity. Following this letter 10-1 asked, Texas collectively opened the two halfs on a 20-3 run. After a Roach drive and layup, a powerful powerful post move capped at 4-0 WVU run, and the mountaineers were suddenly within earshot of a single-digit deficit. Another Roach Layup was followed by a Febres three, ballooning the lead to 51-35 and forcing a West Virginia timeout. Coming out of that quick conversation, Roach cruised for another layup to give himself eight quick points in the half. Ramey then drilled yet another triple before a Sims ally-open jam, and then another all-open dish from Roach to Ramey capped at 12-0 Texas run, which inflated the lead to 60-35, and essentially pushed the game out of reach . 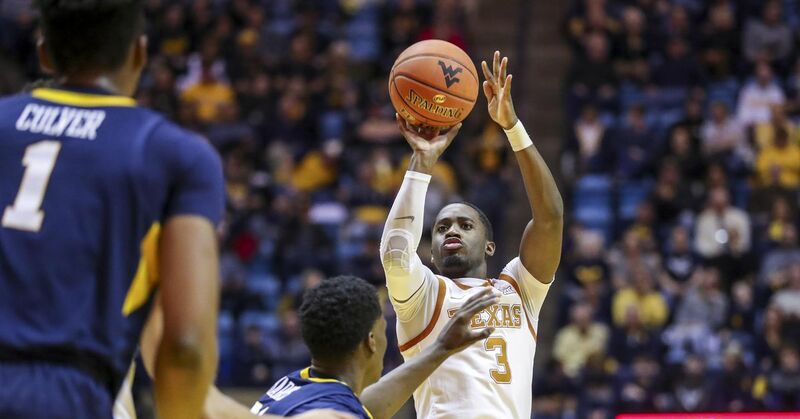 Texas and West Virginia matched each other's outputs over the next eight-plus minutes before garbage time, but the 10-to-10 scoring output throughout that stretched mattered not towards the ultimate outcome; A blowout victory for the Longhorns. Fresh off of his first road win since the Big 12 opener, Texas improves to 14-10 on the season and 6-5 in conference play after capturing three wins in four games. The Longhorns will now head home and get to host the red-hot, Big 12 headlining Kansas State Wildcats on Tuesday at 8:00 pm Central.